Note: this kit is only for non-heated steering wheels. If you have a heated steering wheel then there is a different kit you'll need. It came from South Korea, but it arrived pretty quickly. I had to sign for the package. 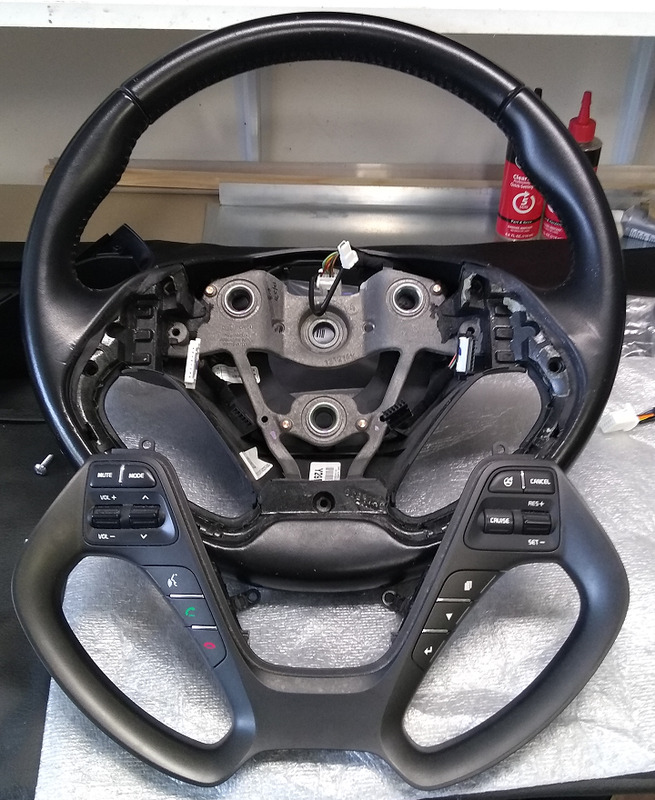 Installing the new parts requires removing the steering wheel and then making all of the modifications on the steering wheel. None of it was hard at all, but I took my time and cleaned everything as I went along. Step 1: Disconnect the negative battery cable and go drink a beer. The FSM says to wait 30 seconds, but I decided to wait about 10 minutes. I didn't want any chance of that airbag still having any kind of charge or the ecu throwing a code if there was still a residual charge. Step 2: remove the airbag. 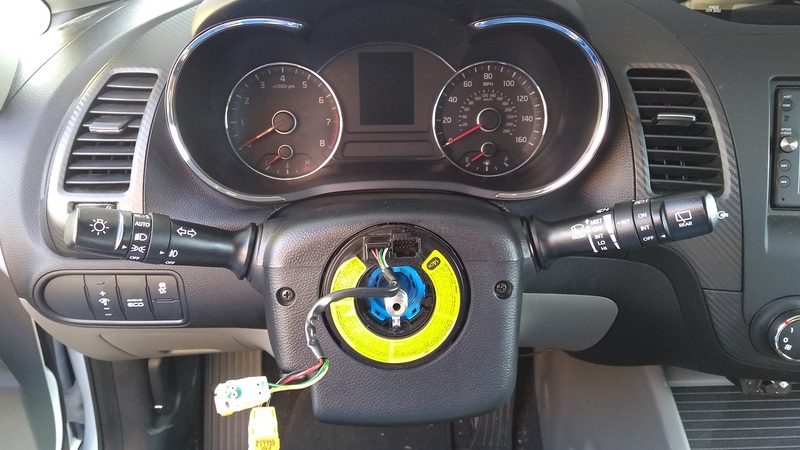 I watched a few videos about removing the airbag, and they all just sort of stabbed at the holes with a screwdriver to release the 3 springs that hold it in place, but I just used a lighted mirror to look in the holes to see what needed to be done. 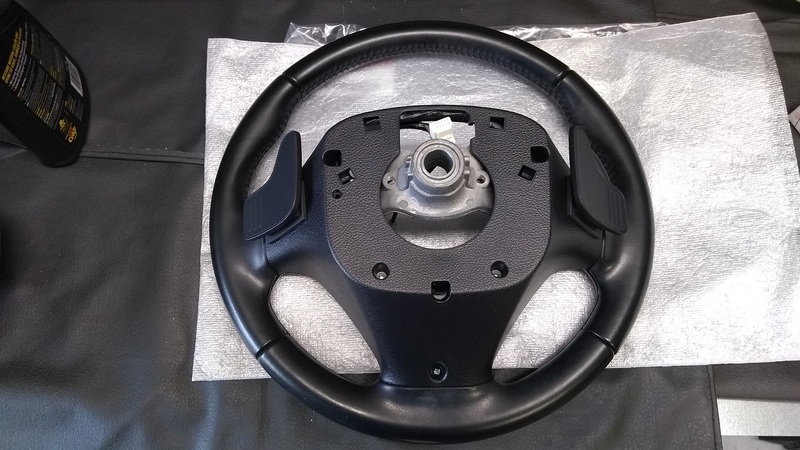 Basically you turn the wheel to the left to expose a hole in the back of the steering wheel, then place a flat screwdriver into the hole and apply pressure downward to release a spring. 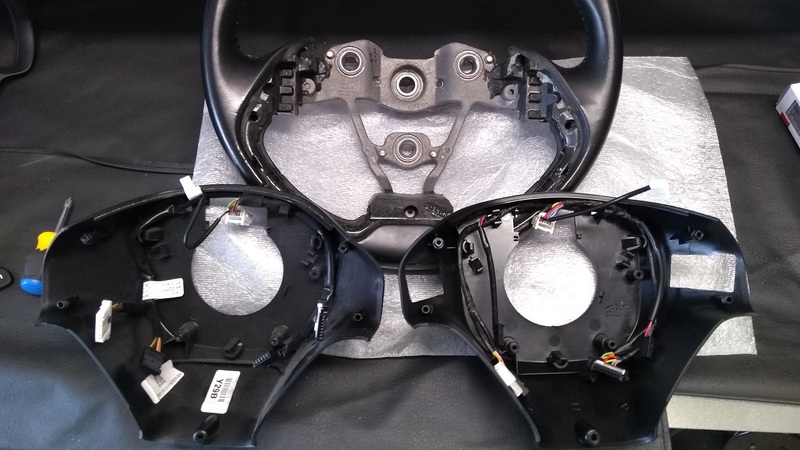 There are 2 holes on the sides and one on the bottom (which requires a 180 degree rotation to access), all accessed from the rear of the steering wheel. Step 3: unplug the horn cable and 2 airbag cables. The airbag cables have plastic clips that need to be lifted up, then the cables come right out. Step 4: remove the steering wheel. There's a single nut in the middle holding it on. I figured it had to be a metric size, but my 13/16" socket fit perfectly. Once I removed the nut, I used a steering wheel puller to pop it off the shaft. Some people just grab the wheel and pull it while rocking, but using an actual puller is much better and easier. After you remove the steering wheel you're left with this. Don't rotate that center part at all! I used some blue painters tape to hold it in place while I did the install. 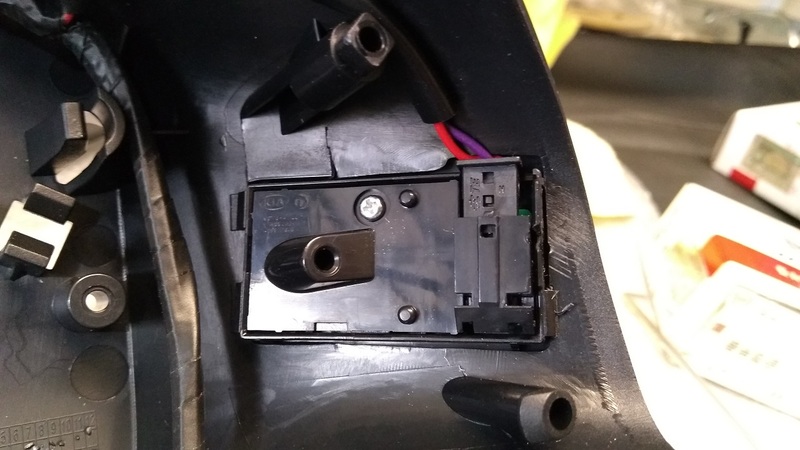 Step 5: remove the 5 screws that hold the lower cover to the wheel (bottom screw is behind the wheel, the other 4 are all clearly visible from the front). Step 6: remove the garnish (this is what Kia calls the piece that has all the buttons on it). This is just pressed on, so I used a plastic trim removal tool to gently pry it off. Step 7: remove the lower cover. At this point it's just pressed in place, so just pry it out from the back. Step 8: route the new wiring harness in the new lower cover so that it matches the routing of the original. Step 9: plug in the 2 wires that go to the paddles BEFORE you snap the paddles into the lower cover. I snapped the paddles into the cover first, and there was no way to plug the wires into them because of the curvature of the lower cover, so I had to remove the paddles then plug in the cables then snap them back in place. Step 10: install the garnish and lower cover. First plug in the 4 connectors into the back of the garnish, then simply press it back into place. The lower cover also presses on, then put the 5 screws back in place to secure everything. 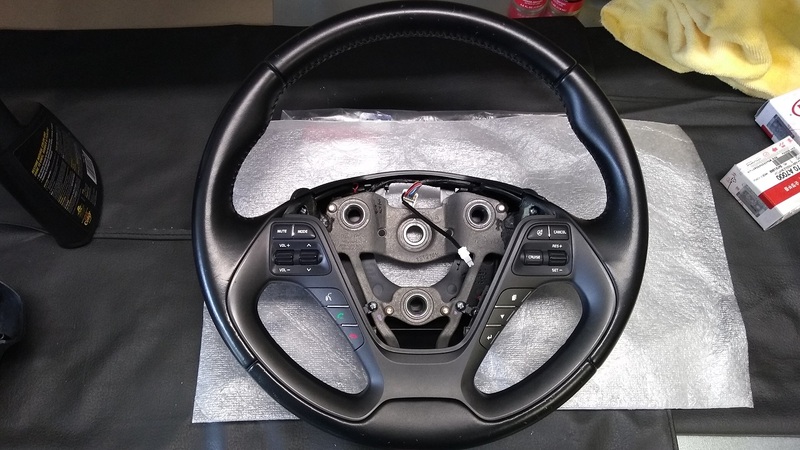 Step 11: install the steering wheel. Just slide the wheel back on the shaft and tighten the nut. You want to make sure you have the steering wheel aligned correctly, of course. I had my wheels straight ahead when I removed the wheel so that it was easy to make sure it was still aligned right when installing it. Step 12: install the airbag. Just plug in the horn and 2 wires going to the airbag and then simply press the airbag back into place. It'll snap right in. Step 13: connect negative battery terminal. You may notice my exhaust sounds nicer than stock. I just installed a new axle back exhaust from Evilla Motorspots. The paddle shifters work great. If you like to manually shift your automatic I highly recommend doing this. Last edited by carl_2112; 03-20-2019 at 12:37 PM. So you are telling me it was just plug in? That is fantastic it was so easy. How do they work on the road? I saw the video, but not sure if the shift really took place. Sure, the number changed, but rpm did not. RPM - I base this on mine, when at idle and stationary, when shifting to 2nd gear - rpm goes up by about 100-150 rpm. Always. Yep, it was just plug n play! The new harness has the two leads for the paddles, and the rest of the wiring harness in the steering column already has the wires for them. They work great on the road. In the video I was just sitting in my driveway and just switched between 1st and 2nd. The car was cold, hence the higher idle, but with my car (2.0L NA) there is no change in engine speed between 1st and 2nd if the car is stationary. I'm going to take another video driving and using the paddles if I can figure out a good way to mount the camera. Not sure how different is the tune for them, but paddles most of the time result in much harsher shifts. Especially in more than half throttle. Even in manual mode, using the gear selector, the shifts are much smoother. Last edited by PLP; 03-20-2019 at 11:40 AM. I just wanted to ask - How the heck did you know they would work? How come you expected the wiring harness to be there? I didn't know 100% they would work, but I was pretty confident. 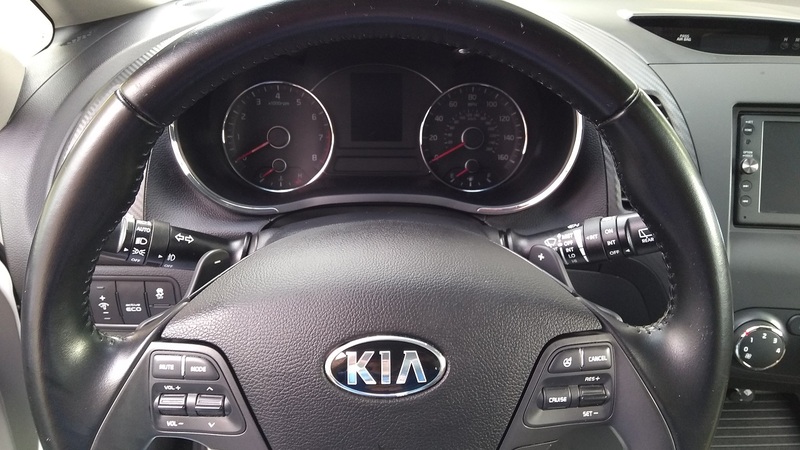 I did some searching and saw other people had successfully added paddles to various Kia models. I was also hopeful since the kit to add the paddles even existed. Granted that could have been a scam. 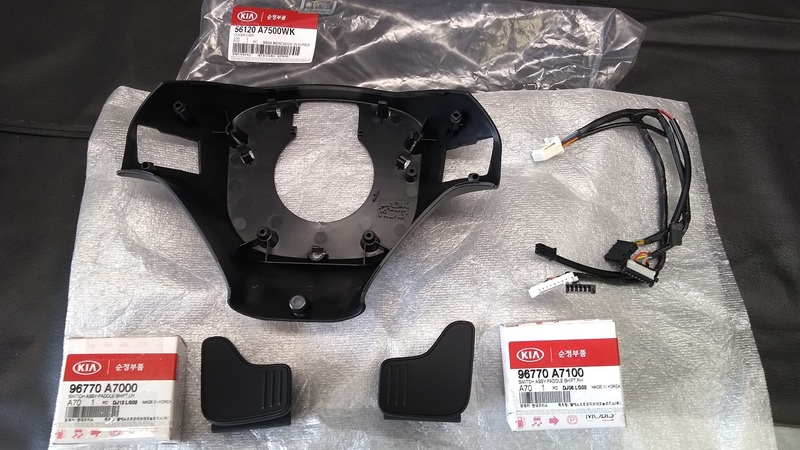 And It makes sense Kia would only make 1 wiring harness for the steering column instead of different harnesses based on model/trim to speed up production. Having different sub-harnesses in the steering wheel itself is much easier to implement though. But I'm glad they work! Now that I've driven quite a lot with the paddles, I have to say this was such a fun upgrade! And coupled with the new exhaust it's just a blast going through the gears. Next up will be an oil catch can and new spark plugs before I take the plunge and get the Tork stage 1 ecu tune, using the OBDII dongle so I can flash back to stock at will. Did you consider getting a spare ECU? I got mine used from eBay at I think 160 or so. Yeah, I've considered getting a spare ecu, but I really like the idea of just being able to read/write the ecu at will without having to swap ECUs. The stage 1 tune is $545, and $160 for a spare brings the total to $705. Plus I would need to make sure Tork is cool with me sending them the spare to flash as well. And my car would still be down while I sent the 2 ECUs to them. The OBDII dongle/software option is $699. Not to derail the thread... but are you sure you want to go tune on NA engine? I heard mixed opinions... Tork is great, but despite being great, if engine does not allow for much - not much can be done. They claim 20 lb/20 hp - did they ever show dynos before/after to actually see the gains? You know, you may get 20 hp at 5800 rpm, while at 4500 rpm it will be only 4 hp, and at 3000 rpm same as OEM. Same with torque - maybe somewhere there is some gain, but in quite useless area. If you had 1.6T - I'd say man - do not do anything, do not waste your money on any mods - go for the tune. You wallet will suffer (93 octane, spark plugs), tires will need to be replaced more often, but each time you push it a bit more you will be smiling. I know that forced induction engines have way more room for tuning, but I'd love to get a little more out of my NA. Actual before/after dyno graphs would be great to see. And if I do go with this tune I may go do that. Fyi, Tork has dyno graphs on their facebook page. It's an impressive increase in power and torque across the entire rev range. I just ordered an oil catch can. I'll be ordering the OBDII ecu tune dongle soon. I just looked, and it says out of stock right now. Go to first new post Top speed?